Go! enter! (but I hope I win!!!! What is filling my rare, spare time? Spare time has been rare lately, and it looks highly possible that it could be more rare soon. Work is getting a bit crazy. But that is blah stuff and you aren't here for that. 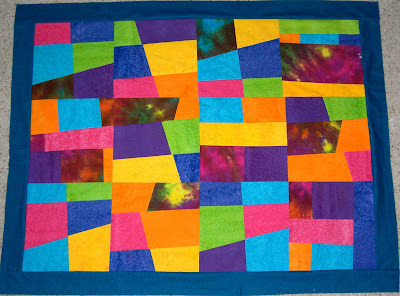 I finished making the lap quilt top that I showed the blocks I call "Framed Squares"
Last night I layered the top, batting, and backing with my fabulous spray basting (AquaNet hairspray) and got started on it. When I got in tonite, I was a bit stressed so I sat down at The Baby and did a bit more. It certainly let my mind rest from the day. I feel better already. Amazing how getting in your creative groove soothes your soul, isn't it? I am doing this in my Crazy Free Motion style. You know I have to make it up as I go. A co-worker likes to look at my free motion and find little pictures. I just laugh and let him tell me what he sees. Now I don't want to scare y'all with my amazing skills. LOL. Right, huh? I hear the laughter all the way here in Alabama. Anyway, I decided that I had to at least TRY a bit of appliqué. So, while I was making the framed squares (see yesterday's post) I realized that I didn't have enough variety in the strips to make it work. So I remembered a layer cake that MATCHED the jelly roll. (I won those somewhere! Thanks!) I took a couple of layer cake squares and cut them down to 9x9. Added a border of jelly roll strips and called it done. Oops, my muse did NOT approve. So I took a couple of charm squares, folded and ironed the edges under and went to The Baby to sew. (Uh, The Baby is my wonderful machine.) I put the charm in the approximate middle of the square. Then I did a blanket stitch around the edges. But the fact is as simple as it is, it IS appliqué, isn't it? Wikipedia says "In the context of sewing, applique refers a needlework technique in which pieces of fabric, embroidery, or other materials are sewn onto another piece of fabric to create designs, patterns or pictures." Since Greg asked- I am sure I will appliqué again. Most likely the next time I will try something a bit "edgier" and more complex than a square. I have seen a pattern with circles appliquéd on it. I could do that now! Just so y'all don't think I am goofing off, I will show you what I am working on. I was planning to cut these into quarters and mix them up to make a type of bento box. I did it with about three of the blocks and didn't like the results. My seams weren't matching up like I wanted them to match. 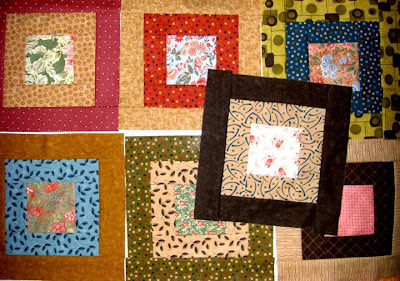 So, having thought already that the "framed squares," as I call them, looked great on their own, I decided to just make up several and make a Framed Square lap quilt. To make these I just took a 5" charm pack and a Jelly Roll. Actually, I pulled from two charm packs and got a couple of strips from a different Jelly Roll. I cut two 5 inch strips and two nine inch strips from one jelly roll strip(JRS) Then from a contrasting strip I cut two 9 inch strips and two 13 inch strips. (make sure your strip is long enough - some aren't - I KNOW! Never mind how, I just know! The set of 5's go on the charm on opposite sides. Press open. Add the same color 9's on the other two sides. Now you have a single framed square. Take the contrasting color and proceed just like you did the previous strips. (Add the short ones, press then add the longer ones) Bingo you have a framed square. One particular quilt top I made has never made it to "quilted" status. It is simply too big for me to quilt on my machine. Well, okay, so I really just don't want to ---mess it up. Yeah, I worked on it a qood while and the fabric is really nice stuff. These days I could piece this top a lot faster than I did, but, that is beside the point. I will have to get it quilted someday. 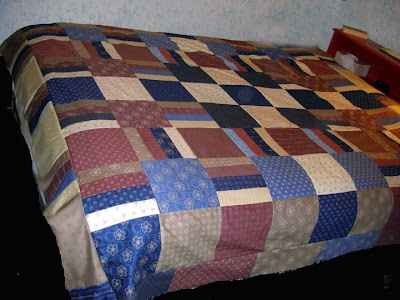 It is very nice and truly a masculine quilt. I still love it, but it is certainly different than my current style. I used just one line of fabrics (so not my scrappy style) and the colors are muted (so not my bright/loud style) Anywho, here is the top on the bed. Whadda ya think? I am really happy! I finished binding the bright lap quilt. It looks really good. 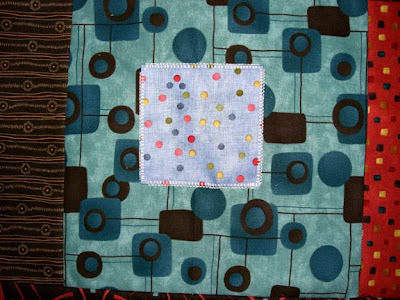 I am not the least ashamed of my free motion quilting. The binding is all machine sewn but it still looks really good. Here are the pictures. I flipped up one corner so you can see the pieced back. It is simply wide stripes in varying widths- Tan, fuchsia, aqua, fuchsia, then tan again. Enjoy! Nothing ticks me off worse than a blatant lie. And using a LIE to sell me something is not smart. I received an offer to renew "Quilter's Home Magazine" today. It had a letter from "Mark" and on the envelope said "a personal invitation from Mark Lipinski"
I was going to "wait and see" about the magazine but that pushed my buttons (don't lie to me) So I called and cancelled the subscription. I know that Mark left the magazine on September 23rd. Sure this was probably already at the printers, but that was no reason to send it out anyway. Sorry for the rant, but it just pushed my buttons so I wanted you all to know in case you subscribe and DIDN'T know the truth. Prize: Fat Quarter Bundle of Red Rooster's Pumpkins & Spice Fabrics by Whimsicals. (27 FQ'a) Blog post required....worth it though! Be sure and tell her "Gene Black sent me!" Yeah I woke up slowly this morning. The temperature had dropped overnight and I slept in for a bit. But once I got awake, I thought "I will do something bright today. So after breakfast, I started on a quilt top. I was going to do it "quilt as you go" but after I got all the blocks made and laid out, I didn't want to add the joining strips. SO!!! I just sewed them together and added a border. I made one cut across it with the rotary cutter and my long ruler. Shuffled it and sewed them together again. Repeat a couple of times. For part of them I did 8 pieces, cut sewed, split into two stacks and the shuffled the stacks and repeated. Get the idea? I needed a couple of extra squares so I made them with whatever was left over. I call that "granny piecing." Because that is something my Grandmother would have done. I added a border to make it a bit larger. Now all I have to do is piece a backing, quilt it and bind it. I wonder if I will finish it this weekend. Wish me luck! One other question- "Is it loud enough?" Are y'all getting tired of looking at these? 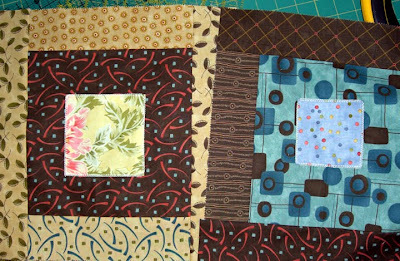 Over at Molly's place she is giving away a subscription to McCall's Quilting. Go over there and enter. Tell her "Gene sent me"
I decided to use one of my small drawings to convert into fabric. This one is made from an Artist Trading Card (ATC) which is two and a half inches by three and a half inches. I may make some color modifications to this. 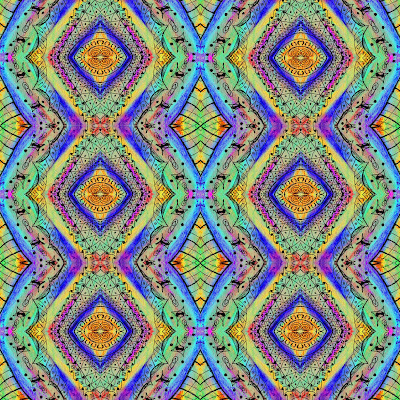 I am thinking of buying some of the printable fabric sheets so I can make several of my designs into fabrics to use in something. Getting fabric printed, unless you work with a fabric company as a designer, is really expensive. So I figure if I can do it myself to see if I like it, then maybe I can justify the expense. I have been thinking for several months that I would LOVE to design fabric. As an artist, I love taking my designs and seeing what I can do with them. This particular design is made from a painting I painted. 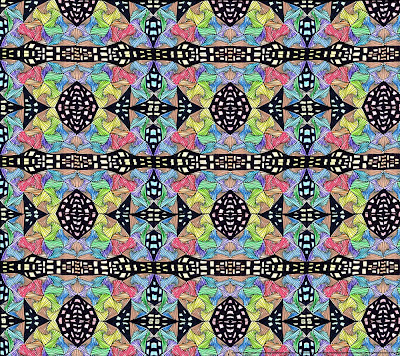 I have also designed some fabrics using my "doodles" and working with them in Photoshop. A friend told me about an online company that will print fabric for you from your own designs. I checked and they print it on Moda Fabric. Without further ado, here is the design. They have an option of rotating the repeat also. So here is the same design with a half drop repeat. Which do you like better? I think I am partial to the first one. But don't let that alter your opinion. Edited to add: You know, after seeing both of them on the blog, I may like the second one better. Amy over at Park City Girl blog is hosting the Fall Quilt Festival. For this Fall entry I am going to tell about this Crazy Quilt I made. First, take a look at this beauty (monstrosity?) Whatever! Ha ha. 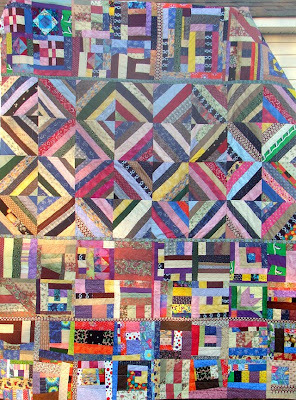 Part of the Festival is telling about the quilt, the quilt's story so to speak. 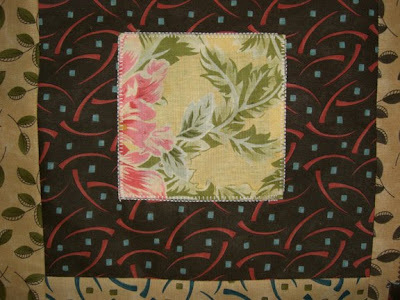 This quilt started as experimental blocks. The string blocks are on muslin foundations and I made them "just to see how it worked" Guess what it worked GREAT. Then the other blocks are huge scrappy blocks. They have no planning involved. I took scraps, strips and the occasional orphan block and just sewed pieces together until it was as big as four of the joined string blocks. I put this together in three big sections that were quilted individually. Those sections were joined in a quilt as you go fashion. I am lucky to have that heritage so I don't feel "boxed in" by the rules and the mythical quilt police. Thanks Granny for making me free. So I finished the lap quilt. It is a D9P and then I added a border of strip pieces. I started to free motion quilt it on Saturday with a polyester batting. This batting was left over from the very first quilt I made. (a good brand name, too, just so you know) I tried to quilt that one on the machine and it gave me fits so I ended up tying that first quilt. The polyester batting had the layers sliding all over the place. The backing got wrinkles quilted in it. ARRRRGH. I got in the floor with the seam ripper and nearly went blind, but I got that free motion quilting all out. I had done about a fourth of the quilt so it took a while. That batting is now reserved to stuff something with or for use in a REALLY SMALL piece. Ugh! So, I got the Warm and Natural (W&N) and did it up right. Here are the pictures. Hi, Just wanted to let you all know that I am still here. I didn't do a lot of sewing over the weekend, but then tonight I totally quilted a lap quilt. WOW ...my new Babylock is amazing. And I bought some quilt clips that hold it in a roll while you quilt. That made it even easier. I didn't go for free-motion on this one, I used a nice big patterned stitch that is built into my machine. I am THRILLED with how easy it was. I may learn to love the quilting part of making a quilt yet. I want to bind it first -then you will get to see it. Okay? The winners are Barbara at Pineland Patches and Pat at Artfully Ooglebloops Everyone leave them a BIG congratulations on this post okay. No sore losers, you are all winners. It is just that these two got prizes for being winners. Barbara said: The new machine looks *great* -- good luck with it. Looking forward to the things you will be making. I know they will be very creative, as always! I can't always keep up with giveaways, but this is one I can't resist. Congratulations on both reasons for it. I'll post about it on my blog -- incredibly unique "fat quarter" fabric prize! Pat (Ooglebloops) said: OOOO - color me VERY green!!!! I would need a college level course to learn how to run that Baby!!!!! Can't wait to see what you do with it!!! OK, enter me in your drawing also - I am a loyal follower, I have a blog, I will mention it later on my blog- and does that give me 5(?) entries? Sorry Pat, this Pat hopes to win also!! LOL Good luck to all!!! Now ladies, YOU have to contact ME. (you are followers, so I am expecting that you actually read my posts. Ha ha.) If you don't contact me, I will be happy to keep this fun fabric. (((grin))) I KNOW you will be in touch. Fabricasrtist21 is a new blogger and is giving away some Moda FQs and a half yard of coordinating fabric.